This month was a huge win for me. 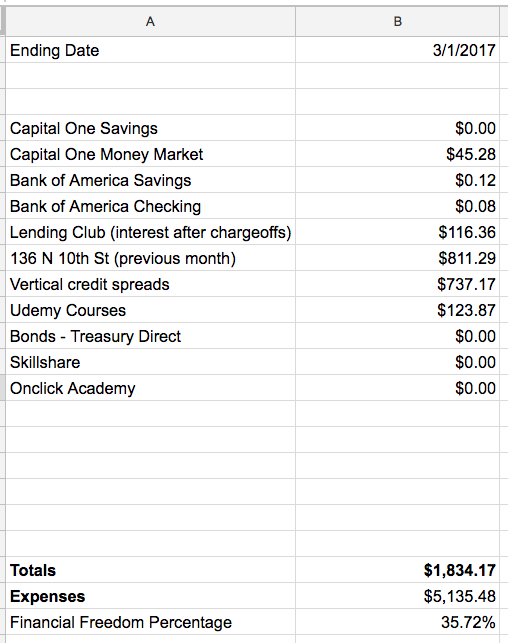 Notice that I started tracking expenses and calculating what my financial freedom % is. Obviously at 100%, I’m financially free! I’ve been long SPX/RUT, which has paid off. Really, I’m just going with the trend. Will it reverse soon? Maybe, but I don’t think anyone really knows. I’d much prefer to be in line with the trend then an angry contrarian for many months or years. Good cash flow this month. No major repairs. One tenant accidentally sent his rent to the wrong property management company (as they have two branches). I had to ask them what was going on to find out this story. Apparently the money takes a few days to be given back to him. He left a good faith $200 with the right property manager, and he’s always paid on time, so I’m going to give him the benefit of the doubt and expect to collect the difference next month. Came through in a big way. I spent a bunch of money on promotions. I’ll give a full breakdown at some other time, but here’s what didn’t work: 1. posting on reddit, 2. adwords. here’s what did work: fiverr. What’s nice now is that some organic and affiliate sales have just started to happen towards the end of the month. And that’s where the real passive income is. I extracted my money from treasury direct. It was paying less than 1% a month. I can do better elsewhere in a money market account. Haven’t received anything from them yet. They only pay out if students have watched 30+ premium minutes. As far as I can tell, I’m at 33, so I expect to get paid something. Settlement date is only on the 16th, so if I get anything, I’ll count it next month. They contacted me out of the blue. I’m literally uploading my courses to their site right now. Let’s see if it can be another passive income stream. Posted on March 4, 2017 by smt	Bookmark the permalink.